Rafa Benitez is prepared to leave Newcastle at the end of the season according to reports. Rafa Benitez is prepared to walk away from Newcastle United if he doesn't sign the two players he wants this month, according to reports. The Magpies have been linked with several players during the January transfer window, but haven't been able to add to their squad. It has been well documented that Newcastle were chasing Atlanta United playmaker Miguel Almiron, while Benitez is also keen to sign another left-back. Yet, with the club languishing just above the relegation zone, any hopes that the Magpies will make a permanent signing appear to be fading, and it is believed the club are now exploring the foreign loan market. Fans have grown increasingly sick of Newcastle's transfer business and, despite the ever-increasing Premier League TV money, the Magpies made a reported £22million profit in the summer window. 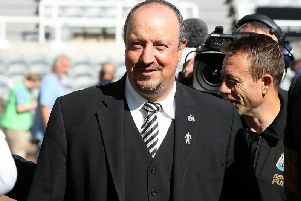 Benitez, too, has talked about his frustrations regarding transfer business and, according to a report in the Telegraph, the Newcastle boss has now reached 'breaking point'. The report claims Benitez, whose contract is set to expire at the end of the season, will leave Newcastle at the end of the season if he doesn't land the players he wants this month. It goes on to say the Spaniard 'gave the club a list of targets in December, with players in each position separated into different price brackets', however no progress has been made. It is believed Benitez, who was appointed Magpies boss in 2016, wants to stay at Newcastle but feels he can't commit if he isn't backed in the transfer market. United have been linked with Iranian full-back Milad Mohammadi and France Under-21 striker Martin Terrier but have just nine days left to sign players this month.